Which is better for mutual funds -- growth option or dividend reinvestment option? Choosing between the two isn't as difficult if you know the implications of both. 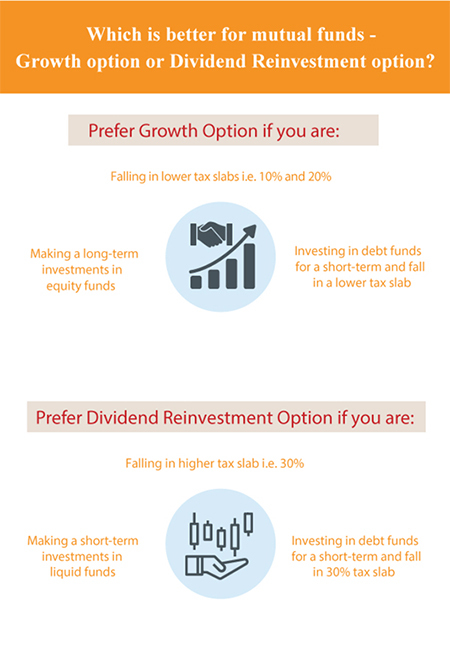 Here's a quick guide on what is a growth option and a dividend reinvestment option and how it impacts your investments. There's a huge debate over how one should have their meals on a given day. While some claim that three full meals, i.e. breakfast, lunch, and dinner, is the way to go, others claim that six meals at fixed intervals of either two or three hours is the ideal way to consume one’s food. While the answer to this question will differ from person to person, there is another debate that confuses the average investors: Which is better for mutual funds -- growth option or dividend reinvestment option? One can either avail the dividend reinvestment option and reinvest the periodic dividends or they can choose to reinvest the entire profit back for more growth? As an investor what would you choose? Allow us to help you with that! Mutual funds with growth option mean that the profit which you make through the fund is reinvested. This increases the net asset value (NAV) of the fund. This means that by the time of maturity, in case of long-term investments, you would make a lot more on the same number of shares than you would have before. Thus, their share in the valuation of the fund increases over time. Mutual funds where investors are given an option to reinvest the dividends they earn are dividend reinvestment funds. Fund manager’s use this money to buy more shares in the fund, which also increases the NAV of the fund. Growth option and dividend reinvestment: How do they differ? On a whole, the two options look very similar, especially in terms of reinvesting the profit. But the only catch here is that while profit is directly reinvested in growth option funds, it is only reinvested as a dividend for dividend reinvested. This reinvestment upon distribution of dividends brings in the term of dividend distribution tax i.e. DDT. Dividend distribution tax of 28.84% has to be paid on the dividends declared. However, this is not applicable for growth option. Here’s how dividend distribution tax makes it noteworthy to understand which option is better in terms of tax-saving for you. Making long-term investments in equity funds: When you make long-term investments, the taxation on the gains is according to the Long-term Capital Gain (LTCG) tax which is tax-free up to Rs1lakh and taxable at 10% on gains above that. Opting for dividend reinvestment would mean DDT, so growth option is more favourable in this case. Falling in lower tax slabs, i.e. 10% and 20%: If you fall in a lower income tax slab of 10% or 20%, then opting for dividend reinvestment and paying 28.84% DDT makes no sense. Investing in debt funds for short-term and fall in lower tax slab: When you invest in debt funds for short-term, it attracts income tax on the returns. If you fall in the lower tax slab, then growth option is better than dividend reinvestment, as you tend to pay only 10% or 20% tax based on your tax slab. Making very short-term investments in liquid funds: When you are investing in liquid funds for a very short tenure and your dividends are being paid either daily or weekly basis, then opting for dividend reinvestment is a better choice. Falling in highest tax slab (30%): When you fall in the highest tax slab of 30%, then opting for dividend reinvestment is a better option. Investing in debt funds for short-term and fall in 30% tax slab: When you invest in debt funds for short-term, it attracts income tax on the returns. If you fall in the higher tax slab, then dividend reinvestment option is better than growth, as you tend to pay only 28.8% on dividends than paying 30% tax based on your tax slab. Hence, choosing between the two would be more biased as both work better in different situations.